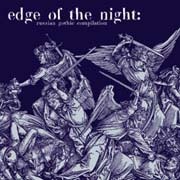 This page is devoted to Edge of the Night: Russian Gothic Compilation. Russian Gothic Project has always wanted to support the Russian gothic scene. As misfortune would have it, quite a lot of gothic bands from Russia do not have professionally recorded albums, so the only opportunity of introducing them to the listeners was the creation of this compilation. We have been collecting the material for this compilation for about a year, you see the final version. Not all of the tracks that were offered by the bands are represented here (it would have done a double CD), this isn't a compilation of the more famous bands - we simply tried to show our scene in all its diversity. Most of the songs included here haven't been previously released, besides, there are tracks from not yet released albums and exclusive mixes. You can buy our compilation via one of our distributors or directly from us: Russian Gothic Compilation Order Information Page. Information for magazines, radio, etc. Canonis - is an ethereal band from Naberezhnye Chelny that started its musical career from doom metal. It presents an exclusive ethereal song with a slight folk tint. The band released three demos, the latest of them (The Aquarel) consisted of two tracks only. Caprice - is an acoustic band from Moscow that plays "elf-music"; "Princess Mee" (lyrics by Tolkien) is deeply ethereal with baroque and neo-classic elements. The bands has a debut CD "Mirror", "Princess Mee" was taken from not yet released album, "Elvenmusic". Romowe Rikoito - is one of the most well-known abroad gothic bands from Russia, it presents a characteristic dark folk song "Elegy". Romowe Rikoito released the "Narcissism" CD in 1996 on Brudenia, at writing the band is finishing recording their new album (the track in question was taken from it). Songs of this bands were included in the compilations of Triton and Exotica labels. No Man's Land - is a Gothic Rock band from Kaliningrad playing original gothic rock in Russian. The track was taken from their latest CD, "Tears". At present the band has a different name, "London/Paris", and is preparing the new material. Neutral - is a Moscow dark folk project that has fair popularity with the local people, it presents "Playroom" from their limited CD-R single. Neutral has two self-released CDs, "The Dream that Destroys the Dreamer" and CDR-single "Playroom". Dvar - is a mysterious occult bands that keeps in secret all the information, including its lineup and dislocation. Dvar is a gothic sensation of the year, their track embodies darkwave as it is. We don't have information about Dvar's releases, but we know their album "Raii" and CDR-single "Taai Liira". Damsel's Dream - is a band from Kurgan that have moved to Moscow. They play something that gothic magazines of the world refer to as dark trip wave. The track is taken from their new CD, "Twilight". This CD will be the third one; first came "Damsel's Dream" and "Pearl Diver". Phantom Bertha - is a band from St. Petersburg that plays orthodox gothic rock, this song previously hadn't been released and was taken from their debut demo, "Black Weepers". Dreams - is a Saratovian band playing synth-goth music with an injection of ethereal. The track is exclusive. Dreams has just finished recording its debut CD, "Dreams". Cyclotimia - a cult industrial/darkwave band from Moscow, presents its new exclusive track "Paradise X". They have a concert CD "Insomnia" and a few demos; fairly soon their new CD "New Death Order" on German label StateArt will be available. Lunophobia - Goth intellectuals from St. Petersburg present a most soft goth rock/ethereal song "Beneath the Snow", track previously unreleased and taken from a nearing single "Beneath the Snow", the band also has a CD "Dreaming of the Sun". Djembe - is a mediaeval band from Novosibirsk! It is the same in its professionalism and sensibility as the best western mediaeval bands. This song hadn't previously been released. At writing, the band is working on its debut CD, "The Hits of the Middle Ages". Kratong - Kratong is a side project of Romowe Rikoito musicians, romantic melancholic dark folk, exclusive track. No recordings available yet. Moon Far Away - sires of Russian Gothic, the most famous Russian gothic band, present their ritual ethereal song from their yet unreleased new album "Sator". The debut CD of Moon Far Away "Lado World" was released at the Moscow lavel "Exotica" and got very good feedback in the western press. Songs of this band were included in compilations of Triton, Arborlon and Exotica labels. Tnt Art - This industrial-darkwave project from Moscow presents its cover of "Better than You" by Swans, exclusive track. At present the band is working at their new CD "Metamorphosis", their first album was "Manifesto". Cisfinitum - is a Moscow band playing dark ambient music. Here is their exclusive instrumental improvisational darkwave piece. This band has a great quantity of releases, both solo and split-albums with various industrial-noise bands. If you represent an edition or a mass medium and you would like to obtain the promo Edge of the Night: Russian Gothic Compilation for reviewing or any other covering the material of the CD, please mail a short description to coroner@gothic.ru. We will discuss it and send you the promo CD together with the press release. Same for the distribution system. We are still seaching for new distributors in Europe/USA, if you are interested in distribution of our compilation, please contact us: coroner@gothic.ru.